This is the second article in a series highlighting the five remarkable design features incorporated into Corvus Energy’s Orca™ Energy Storage System (ESS) product line design—a design that earned Corvus Energy the Electric & Hybrid Marine Technology 2017 Innovation of the Year award, as well as the BC TIA Technology Impact Award for Excellence in Product Innovation. The Orca product line consists of two distinct ESS platforms—Orca Energy and Orca Power—each using different battery cell technology with optimized performance characteristics to match high energy demands or high power demands, respectively. Let’s briefly revisit the terms energy and power, which are sometimes used interchangeably … but which are distinctly different. Energy is the “capacity for doing work”, while Power is the “rate of doing work” or the rate at which energy is consumed. The basic unit for energy is the joule (J), while the basic unit of power is the joule per second (J/s), known as the watt (W). In terms of an ESS for marine vessels, the stored energy or capacity of the ESS is typically measured in kilowatt-hours (kWh) or megawatt-hours (MWh) meaning how much power can be delivered for a specified amount of time. But, as Puchalski describes, as important for selecting the right ESS is the variability of the load—or demand for power—throughout the vessel’s operation profile and the time that the energy stored in the ESS is being discharged. Is the load relatively constant so that the ESS discharges evenly over time, as in a ferry on a fixed route crossing or an ESS used as battery-backup? Is peak demand intermittent and well above average demand, such as a tug that may spend less than 10% of its time at or near its full bollard pull rating? Or are there transient power loads, such as an offshore supply vessel using thrusters for dynamical positioning to maintain its position next to a drill rig? Orca Energy ESS is optimized for energy storage uses with a relatively constant power load and discharge rate. 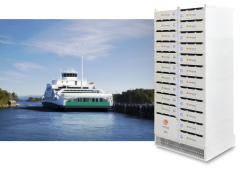 It is ideally suited for use with all-electric short haul vessels, and is a viable alternative for spinning reserve, uninterruptible power supply (UPS) or fault ride-through for the entire power system or for subsystems. 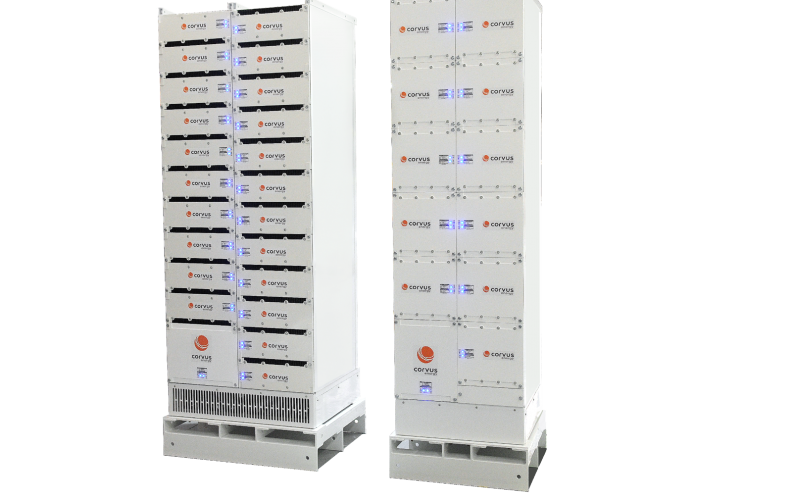 Due to high energy density, Orca Energy ESS offers a low cost per kWh of stored energy. Orca Power ESS is an ideal energy source for uses with variable demand. It is designed for seamless response to dynamic power loads, and can deliver power quickly and efficiently to port cranes, charging stations, and offshore supply, exploration and production vessels. Due to extremely high C-ratings, Orca Power ESS offers the industry’s fastest discharge and charge rates. By correctly matching the appropriate ESS for the operating profile of the vessel and the intended use of the ESS, the economic payback is greatly enhanced—often doubling the return on investment. In hybrid systems, the primary sources of an ESS’s economic benefit are reduced fuel consumption and lower generator maintenance cost due to efficient operation of fuel-based generators. An ESS can be used for spinning reserve, for instant response to transient loads, and for load balancing through peak shaving and ramping of dynamic loads where there is high variation in propulsion loads. These ESS functions allow generators to run less often and at optimal load for optimum fuel efficiency—resulting in reduced fuel consumption of 15%-75% depending on the application. Further, the ESS can replace a generator and its associated capital, operating, and maintenance costs when used in fully electric vessels or in hybrid vessels for backup power, including spinning reserve. Whether Orca Energy is selected for its high energy density and low cost per kWh, or Orca Power is selected for its high discharge/charge rates and dynamic response, Orca ESS is a practical and economical solution for an increasing number of marine applications. Since its introduction in June 2016, Orca ESS has been selected for over two dozen projects totaling over 20MWh, and the technology will only continue to improve the viability of these systems in a greater range of maritime applications. This concludes the second in a series of articles about what makes Corvus Energy ESS different from all the others. View the preceding introductory article entitled, Five Remarkable Features of an Award-Winning Marine Energy Storage System. Compact Design and Streamlined Installation Improves ESS Payback. Subscribe to Corvus Energy Updates or Follow Corvus Energy on LinkedIn to receive all articles as they are posted.